Shintomi-za Theatre, Tokyo, c. 1920. 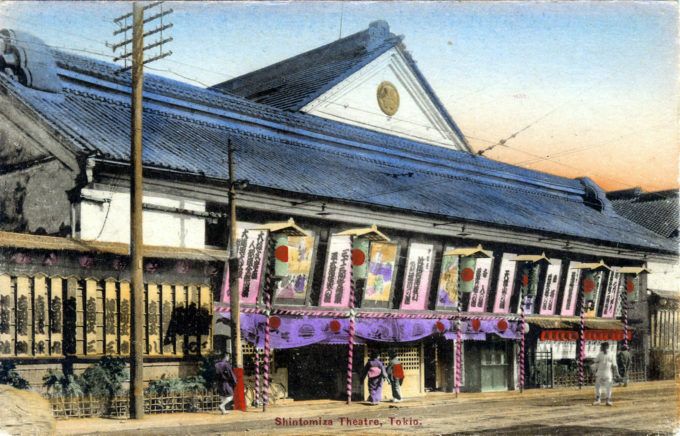 Shintomi-za Theatre (the former Morita-za), Tokyo, c. 1920, constructed in 1878, replaced an earlier venue that burned down in 1876. “From the year 1842 through the early Meiji Period Saruwaka-cho in Asakusa was the center of Edo drama, but the ‘Three Theatres of Edo’ – the Morita-za, Nakamura-za and Ichimura-za – featured surprisingly primitive architecture. Even such new theatres of the Meiji Era as the Saruawak-za and the Shintomi-za showed only preliminary breaks with the earlier architecture. It was not, indeed, until Western drama became popular in Japan that the styles of theatrical architecture were to change radically. “The Morita-za had moved from Asakusa to central Tokyo in 1872, and in 1875 changed its name to the Shintomi-za. The theatre burned down, however, in the following year and the new building, completed in 1878, proved an excellent example of the new trends in Kabuki architecture. As is true with much of the Westernization of Japan, it was the conveniences of Western architecture that were first adopted, and the use of gas lamps in illumination, for example, was to have its effect upon methods of staging.